Heroes and monsters have hit points (though they don't improve much for PC's like in D&D, heroes basically never improve on hitpoints). Characters have some kind of combat point "pools". They can be split into several sub-totals for multiple actions during one combat round. If you do an action, the sub-total that you reserved for the action (like attacking or parrying) is the max for a simple d20 test (like in DSA - The Dark Eye actually, but more dynamic). 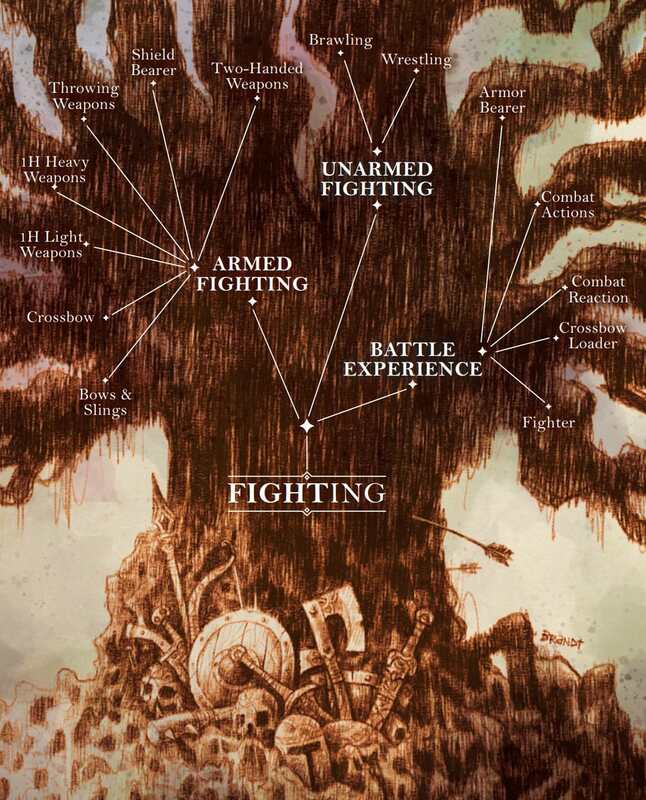 It looks like a total mess in all combat examples, as there are several sources of these combat points and many of them are exclusive for certain uses. Like the specialization for weapon fighting provides points only when using weapons or other skills that provide only points for movement actions, etc. The addition of rules for fear (characters accumulate fear points when fighting fearsome foes, suffering some penalties with increasing points until they become mad at 51+ points...). The magic and prayers system. These magic/prayers reminded me heavily of the Rolemaster spell lists with the twist that all magic is supposed to cause a mirrored negative/positive effect based on the spell in question (you heal someone, someone/-thing else in the vicinity is hurt; you damage someone, someone/-thing else in the vicinity is healed; you magically submit a message, somewhere in the vicinity, some meassage is misunderstood/not delivered; etc.). I would have wished for a rules system that supports the fiction. That links into the background world somehow. Something that helps to feel the danger, vastness and loneliness out there in the woods. The mistrust in violent and (wonderfully alien) human cultures and the wickedness and twistedness of the strange creatures of the forest. My first guestion was: How are you supposed to manage the balancing act between the endlessness and hostileness of Trudvangs beautiful environment and background world and the fact, that roleplaying is about interaction? What do the "heroes" do in this "empty" or at least very much hostile world? The answer to my question on the forum was: Just use adventures from other viking roleplaying games and you are good to go... That's NOT what I think is a good answer, because these adventures - available though they may be - do not convey the specialness of Trudvang in particular. They convey a generic viking experience. Where is the world-specific advise? People coming from a D&D background frequently ask on the forums about "challenge levels" of the monsters... I couldn't care less about building fair encounters, I'd just like to have some support on how to convey the fiction without boring my players to death. After one or two sessions I'd be out of options to describe all those wonderful nature, transport the setting into the next big city and just skip the nature part... Maybe I'm not creative enough for this game. ...it is just ingenious. It's an easy to learn, creative sandbox with rules specifically and carefully tailored for one narrowly focused kind of fiction. The PC's are a crew of scoundrels in a post-apocalyptic gloom-/steampunk city named Doskvol or Duskwall, starting from a small "garage operation" and being able to follow their agendas up along the ladder of the criminal underground. In order to get extra dice, player's can accept a Devil's Bargain, presented by the GM or other playaers. These are disadvantages in relation to the action in question that they can impose unto themselves in this way. My favorite is Flashbacks. Especially in games, where the group is planning and conducting heists a lot, this planning can take hours and hours, just to break down completely with the first encounter on their way to the goal and dissolving into chaos and mayhem. Instead, in BitD, the players set a certain tectic (assault, deception, stealth, etc.). Together with the plan comes one detail: Where do we assault? What is the angle of the deception? And then starts the score... An initial engagement roll determines the starting situation. How is the entry going? Any immediate complications? Then, its a flow of action, complication and reaction going on and on until fulfillment. Any time the group faces unforeseen obstacles though, the PC's can introduce flashbacks. These are basically the same as narrative effects you could buy for Drives in SaS, but instead being attributed to sheer luck, the player explains how he prepared for the provision to be there. Instead of "I jump out of the window on the hay cart, driving by miraculously in this very moment" the player describes a short scene where he prepared for the cart to be there in time. It feels professional. Like the Ocean's movies. BitD is the definition of focus: the scope of the fiction is clearly defined as per above and the rules are tailored to it. Many "hacks" are now being generated by fans labelled "Forged in the Dark"-hacks under the umbrella of the publisher to cater for different tastes, but every single successor system is still focused. This means for sure that there is not so much freedom as in S&S. While S&S lets the player choose Drives from an infinite number of open ideas and lets you play campaigns from stone age into the renaissance and from military backgrounds to the intrigues at court out of the book, BitD lets you choose the general vibe of the campaign: Want to kill people? Play an Assassin crew. Want to deal with illegal goods and their transportation? Play a crew of Smugglers. etc. But in the end, all crew types are made up of scoundrels in the gutters of this one city. John Harper (the author of BitD) included an extensive chapter on how to play BitD. Which is very much appreciated, as the system is much different than any other RPG I played before (though with some similarities to the premises of S&S). He has a chapter of best practises and advise for players and one for the GM. All in all, the mechanical side of BitD can look a bit ... well, mechanically. But in fact, at least watching John Harper GMing on Twitch or Youtiube, you can see the gears working together to inspire the fiction and deliver action at all times. Anyways, this is not to say that BitD and SaS are in any way redundant, but they are similar enough in player-driven-fiction-focus to learn from each other. And also from the faults of Trudvang. I'd just wish SaS to include a chapter where the GM and the players get some advise on how this particular system works best in the form of best practises. And have some Amon Amarth playing. Yes, this is good artwork. Breaks away from the stereotypical my-PC-is-badass poses we usually get nowadays. Apart from the artist's skill which is evident, there is narrative conveyed, which imho should be the #1 goal in RPGs artwork-wise. For the rules I can't say much, apart that it sounds segmented for no reason. Is there a solid core mechanic? By the looks of it not really. More like circumstantial rules exceptions. Hitpoints are not bad by themselves. The notion that throughout 10-1 hp you function perfectly and at 0 you die is bad. And slabs of hit points. After all, if you think about it, S+S also has hit points. 5 to be exact. What if they are called Wound Levels? It's the way the whole functions that makes it great. Always liked Fear concepts. Still tracking shite to the 50s sounds horrible. Survival and Travelling. That's a thing that sounds a bit rushed. I've always had my players roll up shite like this up front at the start of a trip. The better the roll, the smoother the trip. Bad roll? More encounters, lost time due to bad weather, provisions packed improperly resulting to moldy food, etc. Especially 'Bastards with Margin of Success/Failure works like a charm with this. Oh, and I always have custom "encounter" tables that include anything from fights to heavy rain and earthquakes. A little planning can go a long way. EinBein wrote: How are you supposed to manage the balancing act between the endlessness and hostileness of Trudvangs beautiful environment and background world and the fact, that roleplaying is about interaction? What do the "heroes" do in this "empty" or at least very much hostile world? Seriously now, did they have the Devil running at their backs shouting "DEADLINE - DEADLINE" or something? When designing a world specific game it's better to detail the world and say something like "use OpenD6 or whatever..." than this: " Just use adventures from other viking roleplaying games and you are good to go..."
Now this sounds better. Sanbox me likey. But. I personally get bored of post-apocalyptic steampunk stuff. Sorry, just not my thing. I might "borrow" a rule or three tho if it is as good as you say and I get my hands on it. Don't forget that we have a Faction chapter pending hopefully. Which is the first thought that came to mind when I read the above. EinBein wrote: Anyways, this is not to say that BitD and SaS are in any way redundant, but they are similar enough in player-driven-fiction-focus to learn from each other. And also from the faults of Trudvang. I'd just wish SaS to include a chapter where the GM and the players get some advise on how this particular system works best in the form of best practises. Imho the heart of 'Scoundrels - as 'Bastards before it - is Drives. You can't go wrong with them. It needs some planning on your GMing to get it rolling, but when it does, it hits you and the players like a truck filled with bricks. Just don't forget. In order to do that you have to act like a mischievous genie that twists wishes around. Make em love the setting and the characters through narrative, then make it tumble upon them for everything they chose. Like what thirtythr33 did in Floating City. Benedict wrote: Yes, this is good artwork. Breaks away from the stereotypical my-PC-is-badass poses we usually get nowadays. Apart from the artist's skill which is evident, there is narrative conveyed, which imho should be the #1 goal in RPGs artwork-wise. Benedict wrote: [*]Hitpoints are not bad by themselves. The notion that throughout 10-1 hp you function perfectly and at 0 you die is bad. And slabs of hit points. After all, if you think about it, S+S also has hit points. 5 to be exact. What if they are called Wound Levels? It's the way the whole functions that makes it great. I believe this is a matter of taste. The damage system in Trudvang is also easy: Every weapon deals 1d10 damage when connecting. Depending on the heaviness of the weapon, it gains a larger "open roll" range (exploding faces). One handed light weapons have OR10 (reroll 10's), one handed heavy weapons have OR 9-10 and two-handed weapons have OR8-10. If you have a lot of exploding dice, it's basically a critical. Nothing to do with skill value here. The problem with active attack and parry (same as in our German "Dark Eye" with binary results for both rolls is, that there will be a lot of rolls where nothing signifcant happens. Either because of an attacker's miss or a successful parry. This is basically the Combat Pool, but you can only use the mentioned fractions for actions with related equipment or maneuvers... I'd need a computer for every player to be able to keep track of that in parallel of the chaotic initiative and fear systems! Benedict wrote: [*]Always liked Fear concepts. Still tracking shite to the 50s sounds horrible. In this case, it's just another figure to track. The hitpoints are bad already: You get penalties when they drop below fractions of the max. value and need always to campare max. and actual values and be reminded of the applicable penalties... Fear is just adding on top of that with other steps and penalties. Especially for a game world and system that is so much reliant on nature experience, it was quite disappointing. Maybe I have to add that this KS was about translating an established award-winning Swedish system into English language. As part of the KS, two adventures were translated as well, but both are high-level adventures. There is no "introductory course" and - as I said - no soft advise either. This is one of the major setbacks: You have to like the setting, or the basic rule system isn't for you. There is light at the end of the tunnel though, as during the successful KS, a lot of official "hacks" were unlocked, which are still worked upon. The first is about to hit the shelves and can already be acquired on DriveThru: It's called Scum & Villainy and is about crews of criminals with a Star Wars / Serenity / Outlaw Star / Firefly vibe. The crew is basically replaced by the ship and the ability to interact with the ghost-world from original BitD is replaced with "The Way" (like The Force... you know?). Scum & Villainy is a complete ruleset though. You wouldn't need BitD as a basis. Benedict wrote: I might "borrow" a rule or three tho if it is as good as you say and I get my hands on it. Nah, this is quite different. BitD has also a faction system, but crews are about linking together the group of PC's with a common goal and bringing expectations of the players in line and providing a metagame asset that can evolve. On some basic level, the crew acts as a faction as well - especially when it becomes larger (more followers) - but at first, it's just a bracket that holds together the party. True. But you get clocks as an easy tool to track the multitude of things that the players can challenge themselves with. Actually though, as I haven't played it myself (just followed the youtube Rollplay: Blades series a bit) I need to see in reality how this helps or does not help. Blades is indeed awesome for all the reasons listed, although I haven't played it yet. The layout and writing is a model of clarity and vision. It does have the usual element, common to a lot of slightly-weird RPGs, of being easy to assume it's your run-of-the-mill game when read by old hands at the hobby. Then important rules are missed, or the reader assumes that it should have rules for XYZ and when they aren't there, then the game's broken. Ryuutama is a Japanese RPG, translated into English a few years ago. It is designed around a "heartwarming" aesthetic which is apparently a trend in Japanese RPGs. It has a very pastoral feel, maybe "anime bildungsroman"? -- it's tempting to call it "cutesy" but that doesn't quite capture it. You can still die, but the feeling is more of wonder and discovery than grimdark murderhobos or fantasy Vietnam. The theme of the game is traveling and friendship. In the setting, everyone is assumed to take a journey at some point, and travelers join up together because the wild can be dangerous. Reward cycle: PCs get XP for the most dangerous terrain they've traveled through this session, XP for the most dangerous monster they've fought, and XP if the GM used a special power. Despite the game's look, it has a really crunchy journey system that is similar to The One Ring's. You make checks to find your way, to avoid incident, and to make camp. The difficulty of the check is based on the terrain (plains are easy, mountains are hard) plus the weather (clear skies are easy, blizzards are hard). You have to track encumbrance, rations, water, etc. It all serves to underscore the feeling that journeys are hard and dangerous and you have to plan. The combat system is semi-abstract and reminiscent of Final Fantasy or some other JRPG. You are either at the front of the skirmish or the back. If you're in the back, you can only hit or be hit with ranged weapons or spells. If everyone in the front goes down, everyone in the back is automatically moved to the front. The bestiary is wacky and cute -- a recurring enemy are cat-goblins, and another are anthropomorphic eggs that have arms and legs. Spells are nature-based and thematic. They are in schools named after the seasons and work about as you'd expect. One of the spells creates a cubic meter of dry leaves. That's it. No damage or anything. I love spells like this -- it really requires the players to be creative about how they use them. The GM plays a character, a godlike celestial dragon called a Ryuujin. The conceit of the game is that the Ryuujin is watching the PCs from the spirit world and writing down their adventures. Why write stories? Because that's what baby dragons eat! You don't want your babies to starve, do you? The ryuujin has a variety of powers they can use, that broadly correspond to traditional ways that GMs fudge. Some of the powers help the PCs and some hurt them. If the ryuujin uses the ones that help (e.g. a PC you thought was KOed wakes up with half HP), it loses HP and could die, ending the campaign. If it uses the ones that hurt (e.g. a monster that misses gets to swing again) the PCs get XP. So this lets you, as GM, do the traditional bad-habit things, but it puts a cap on them so you can't go too crazy. It's a neat system and really kept me involved -- do I want to save the PCs here, or hope they get lucky and keep my power for a more dangerous encounter? In our campaign, the PCs cleared a marketplace of cat-goblins, failed to reunite a single mother and her madman-of-the-woods former husband, and then investigated a crop failure. In between all those scenarios were harrowing journeys across the wild, with twisted ankles, lingering coughs, and going hungry. The last scenario ended with a Dogs In The Vineyard-type climax -- the crop failure was due to a local witch, who cursed the wineberry crop because her brother drunk himself to death. The town elders wanted to execute her for destroying the town's livelihood. The PCs ended up restraining themselves and not interfering with the execution, in a moment of high drama and pathos. - 1 XP for showing up to the session. - 1 XP for working on a project on the Ark. - 1 XP for exploring a new sector out in the Zone. - 1 XP for sacrificing or risking something for the PC you've chosen as your "buddy." - 1 XP for sacrificing or risking something for the NPC you've chosen to keep safe. - 1 XP for sacrificing or risking something to mess with the NPC you've chosen as the one you hate. - 1 XP for sacrificing or risking something to work towards your (player-created) Big Dream. We created the setting together (basically set it near the town where my group lives). I showed them the XP table -- "Here's how you get XP. What do you want to do?" The rest of the game flowed like magic. As GM, the only thing I need to contribute are interesting threats to the PCs' favorite NPCs. And I provide plausible reactions to the PCs' actions. The rest is totally player-driven. The exploring part is procedurally-generated using random tables, so I have no idea what they are going to find. An enclave of mutated horrors? An artifact of the Ancient Days? Both? Easy to run, easy to play, zero prep. Anways, MY0 looks like a gem. Though I'm not a huge post-apocalypse fan. We tried Degenesis once. Wasn't for most of the group. The only post-apo scenario I ever liked was Gorkamorka tabletop Because Orks. I've bought the PDF anyways in order to learn from the rules!